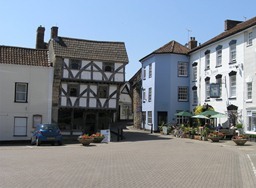 The medieval town of Axbridge has a history that dates back to Roman times. At certain points in history the town has been a major business centre in the area but nowadays is a quiet and peaceful place to live. The town offers a variety of shops including butchers, post office, pharmacy, cafe, doctor’s surgery, hair salons, a cinema and several good eating establishments. For those visiting the town there is plenty to see. King John’s hunting lodge set in the medieval square is popular for those interested in history. St John’s Church dates from the 13th century and many of the houses in the town centre have long histories also. Axbridge first school is listed as one of the top first schools in the country and children then go onto Fairlands in Cheddar and then onto Kings of Wessex Academy also in Cheddar. The three tier school system is very popular and does attract families to live in the area. Only 1 mile from Cheddar, Axbridge is within easy reach of the M5, A38, Bristol airport, Bristol, Taunton, wells and Weston-super-mare. Click here to search our database of properties for sale and rent in Axbridge.